Mangalore: Mangalore played host to a three-day festival, "Tibet: Cry of the Snowlion", to showcase the Tibetan freedom struggle, organised by the Tibetan Students' Association of India (TSAM), in association with Friends of Tibet (India), Mumbai. "The festival is one of the events we've planned this year to spread awareness on the Tibetan freedom struggle, contemporary Tibet under the Chinese rule, and its tradition and culture that are in stake. Our brothers and sisters in Tibet look to us in exile with great hopes for freedom, and it is every Tibetan's responsibility," Pema la, president of TSAM, says. An exhibition of photographs, "Long Look Homewards", portrayed the life of Tibetans before exile and shed light on their freedom struggle. 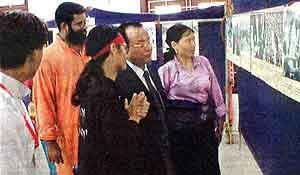 The association will organise similar exhibitions in Pune and Hyderabad, Pema la says. The visitors were treated to Tibetan tea and snacks. The 'Snow Lion Dance' and 'Tashi Sholpa', traditional Tibetan dance, enthralled them. The second day of the festival had documentaries, 'Tibet: Cry of the Snowlion', 'Escape from Tibet', 'Windhorse' and 'Kundun' for the visitors. Special lectures marked the end of the festival. Sethu Das, president of Friends of Tibet (India), spoke on 'Why Tibet' and Tenzin Tsundue, writer and activist, dwelt on 'Young Tibet' on the new generation of Tibetans growing in exile. The highlight of the festival was the 'Tibetan Food Festival' with musicians playing the background as the visitors savored the delicacies. The Inspector General of Police (Western Range), Dharampal Negi, who inaugurated the event on October 6, 2003, advised the association its functionaries to consider India as their second home.